I think an Ipod puts less carbon dioxide into the atmosphere, thus contributing less to global warming than a wood stove. It does take some energy to make the Ipod, but not much to use it. Overall, probably less total "carbon footprint." A friend of mine pointed out, you can't cook over an Ipod. True. Nor will it heat your home. When He said that, I immediately thought about parabolic solar cookers, for some reason. Science to the rescue. 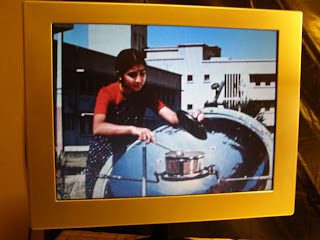 This cooker featured in the 1956 documentary about the sun titled Our Mr. Sun.